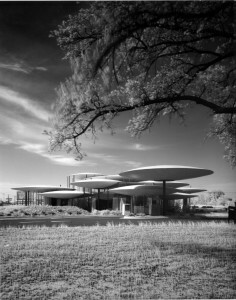 Even though this space-age bank has been altered, there are still enough original elements to make for an interesting shot and to include it among OKC’s best mid-century buildings. When publisher J. Leland Gourley wanted to construct a new building for his newly-chartered bank, he went right to Robert Roloff, who had designed the famous Citizens State Bank (a.k.a. The Gold Dome) a few years before on NW 23rd. He told Roloff that he wanted to make Citizens look old fashioned and boring compared to the thoroughly modern bank he envisioned; Gourley wanted a real “bank of the future.” Roloff was up for the challenge and designed a building straight out of a Jetson’s cartoon, with 17 hovering saucers supported by rounded, floor-to-ceiling windows. 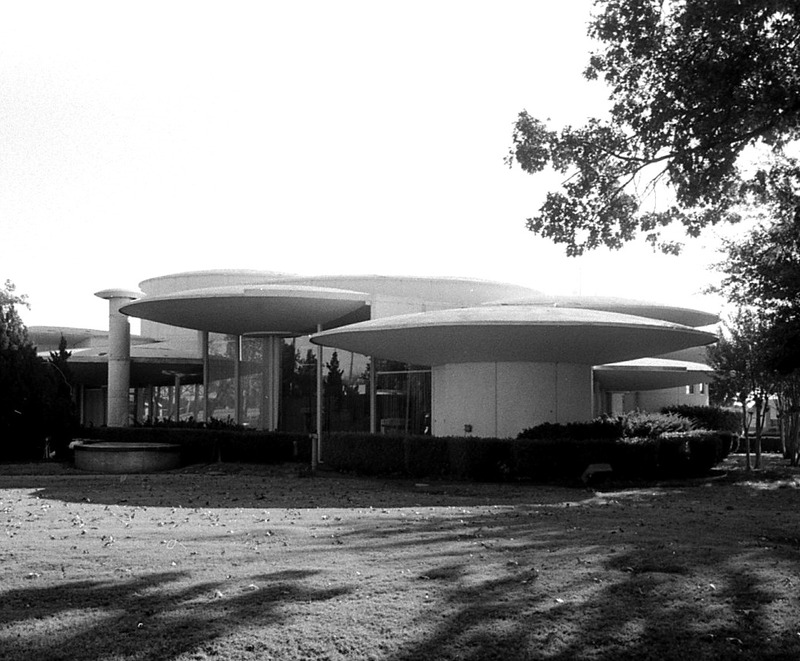 Inside, patrons could take the “floating air lobby,” a round elevator with a booth for comfortable travel (and maybe a martini or two), to the basement’s safe deposit boxes. The bank also boasted the first “TV Teller” window west of the Mississippi. It was, and although it has changed hands and is now an Arvest Bank, it continues to function in its original capacity today.